Caption What? The Sixth Annual Expo for the Artist & Musician When? Saturday September 10 2005 11:00 am-6:00 pm Where? SomArts Gallery 934 Brannan St. x 8th St. San Francisco CA 94103 Good Eats! Food by Memphis Minnie's BBQ Joint & Smokehouse. Veggie options available. REGISTER FOR A TABLE This is an open invitation to arts and community organizations including nonprofits small businesses schools galleries venues studios service groups etc. 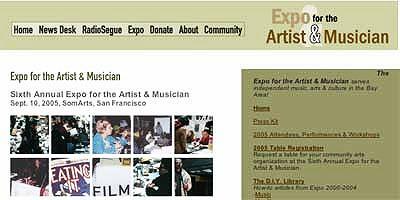 to sign up for a table at Expo for the Artist & Musician 2005. Sponsors The Expo is made possible in part by the Walter & Elise Haas Foundation the Zellerbach Family Fund the Wallace Alexander Gerbode Foundation CompassPoint Nonprofit Services Kearny Street Workshop Laughing Squid the San Francisco Bay Guardian SoundSafe Hosteling International Nub Chai Frey Vinyards and The Switch. What is the Expo? The Sixth Expo for the Artis & Musician is the Bay Area’s only grassroots connection festival for independent arts music and culture -- an all-day extravaganza featuring over 100 Bay Area arts organizations free workshops performances and hundreds of local artists and musicians. Attendees can browse tables staffed by local galleries nonprofits collectives and small businesses; present their portfolios and music demos; and participate in seminars on marketing their art finding grants starting a collective building a home recording studio understand artists’ legal issues and much more. The Expo exists to help creative people and organizations of ALL types find resources promote themselves and connect with like-minded individuals. As part of our commitment to keeping the Expo affordable and accessible admission is only $2 at the door and no one is turned away for lack of funds.